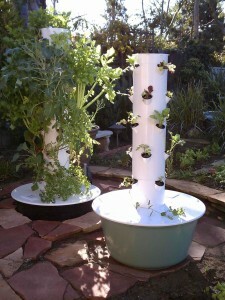 Grow fruit and vegetables right in your own yard, apartment, patio or patio stairway vertically while maintaining: a small footprint, eighty percent less water use and no need for pesticides. The systems are fairly simple with no electronics, sensors or motors. You could makes these right in your garage with simple tools or may want to purchase kits.